Mr. and Mrs. Lowman live in the rural town of White Sulphur Springs, Montana. Located nearly 75 miles from the nearest stoplight, the Lowman’s ranch sits on a small hilltop outside this quaint community. One evening this past February, as the couple began settling in for another quiet night at home, something unexpected happened and Mrs. Lowman wound up in the fight of her life. Shortly thereafter, Mrs. Lowman began to experience intense chest pains. Not wanting to make a fuss, she reassured herself that the pain was just indigestion and that it would pass. However, the longer she sat there, the worse the pain seemed to become. Soon she was yelling to her husband for help. Within minutes, the Sheriff was outside the Lowman home shoveling snow from the back walkway so the paramedics could get inside the house. Soon Mrs. Lowman was loaded into the back of an ambulance on her way to Mountainview Medical Center. There, her doctor would discover that she was having a heart attack. Being that Mountainview is a small rural hospital with limited resources, Mrs. Lowman’s physician knew right away that she would need to be transported to a larger facility for care. However, the closest hospitals that could treat her were located two hours away by ambulance. With the weather being poor and time being of the essence, her doctor knew she would have to be transported in the fastest and safest way possible – via a helicopter. The hospital placed a call to REACH’s 24-hour communications center to request a helicopter. They would be sending an aircraft from REACH’s base located in Bozeman. On duty that night were Pilot Jordan Gipe, Flight Nurse Emily Rex, and Flight Paramedic Jesse Baysinger. “We were told the patient was experiencing chest pains, so we knew exactly what to expect when we arrived,” said Emily. Upon landing safely at the hospital, the crew set about preparing Mrs. Lowman for transport. After assessing her condition, Emily and Jesse knew that it was going to be critical that they think two steps ahead in terms of clinical care. 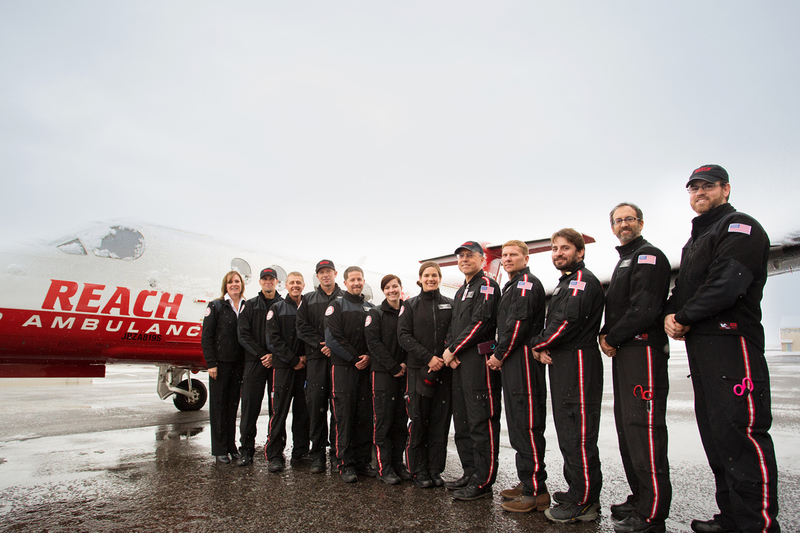 Crew members from REACH 24, 25 and 57 in Montana. After completing all their assessments and pre-flight preparations, Emily and Jesse talked the Lowman’s through the entire transport process. When all their questions were answered and Jesse and Emily had taken down Mr. Lowman’s cell phone number, they set out toward the helipad. With the aircraft safely loaded, Jordan lifted the twin-engine AW109 helicopter and departed for Billings. Despite being outfitted with the most advanced safety features, this aircraft is no match for the sometimes-unpredictable weather in Montana. Shortly after takeoff, Jordan knew that for everyone’s safety, he had to return to the helipad in White Sulphur Springs. A bad snowstorm was moving in quickly along the flight path to Billings and they wouldn’t be able to safely navigate around it. This happens in air transport and making the safe decision is paramount for everyone on board. They were going to have to move to Plan “B.” With the help of the staff at Mountainview, they began looking for other facilities that could treat Mrs. Lowman – Bozeman Deaconess is the hospital they selected. While back at Mountainview, Jesse and Emily tried to reach Mr. Lowman so they could update him on what was happening. After several unsuccessful attempts, the local Sheriff finally made contact and provided him with an update. With Mr. Lowman now headed off toward Bozeman, it wouldn’t be long before his wife followed in the helicopter. Once they received clearance, the crew loaded up once again and were off. During the flight, Emily and Jesse paid close attention to Mrs. Lowman’s vital signs and were prepared to act if her condition began to decline. In addition to providing excellent clinical care, the pair also provided Mrs. Lowman with a bit of emotional support. Because she was outfitted with a headset, Emily and Jesse could talk with her throughout the flight and make sure she was feeling comfortable and at ease. It wasn’t long before Jordan was safely touching down on the helipad of Bozeman Deaconess Hospital. There, Emily and Jesse delivered Mrs. Lowman into the hands of a clinical team that would take her right to the Cath lab for imaging, and eventually, into surgery. Altogether, Mrs. Lowman had to have two stents put in her heart; but just three days after her flight with REACH, she was well enough to go back home to the ranch. We are happy to report that today Mrs. Lowman is feeling 100 percent. In fact, she feels so good that she recently decided to fulfill her lifelong dream of opening her own antique shop. Hilltop Antiques opened its doors this May, and in addition to telling everyone about her new business venture, Mrs. Lowman has made it her mission to help spread the word about both REACH and the AirMedCare Network membership program. "And against all odds, Micah and I survived ..."
"Peter and Scott calmed me down and really made me feel safe and secure." "I really got the sense that they cared about me as a person, and that made me feel as comfortable as I could be in that situation." “My husband and I have been Cal-Ore members since we moved to Brookings in 1995. It’s a service you never want to use, but in a heartbeat I’d trust them with my life"
“Without air transport, I don’t know what would have happened to me that day." "Karson was so appreciative for everything that we were doing for him. He held our hand for most of the flight and just kept thanking us for taking care of him." "The crew was amazing, caring and by far the most understanding people I have ever met." “I am so grateful for everything that everybody has done, and is still doing, for me." “It was so great that REACH was available, that we had access to that service." "The experience we had with the flight crew and with Woman’s Hospital—I can’t say enough." s humbling to step back, take a breath and truly do what the patient needs most in that moment." “The thing I remember most is the attention from the crew. They were really in touch with what was going on. " "They give you a sense of calm that’s infectious. It allowed us to turn a corner as a family." "If REACH hadn’t been there, I don’t know if I would be alive today or not." "I’ll never forget that they decided to stay. "They gave me the comforting words I needed. They gave me hope." We believe in our mission to ‘Always do what is right for the patient.’ It may sound like a cliché, but REACH truly does go ‘above and beyond’. "It was a breath of fresh air when Cal-Ore showed up to fly me away." "They were the absolute definition of caring professionals." "Their professionalism and skills went above and beyond the call of duty." "The REACH crew were amazing." "I finally got to hold Hunter for the very first time. It was amazing!" "Because of REACH…well...they’re the only reason I’m alive." “I want to thank each and every person who had a hand in saving my life that day." "I can’t thank the AirCare EMTs enough for helping my wife breathe again. If I may say so, they are angels in disguise." "It was just a remarkable flight for me to be a part of, as well as making a difference for this patient." © 2019 REACH Air Medical Services. All rights reserved.